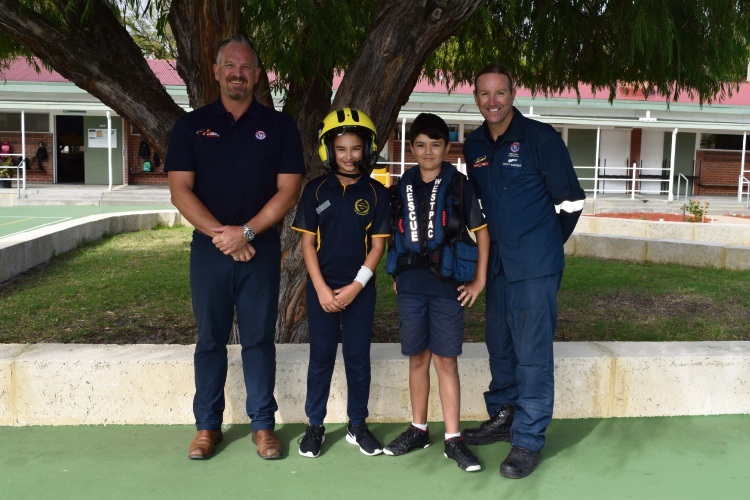 Surf Life Saving WA aerial surveillance lifesaving officer Andrew Rogers, Embleton Primary School student councillors Lidia Mjaissir and Duncan Eathorn and Fremantle rescue crew chief Scott Hardstaff. EMBLETON Primary School students tested out lifesaving equipment and learnt safety tips as part of a special visit from the Westpac Lifesaver Rescue Helicopter Service (WLRHS) this morning. The school was selected from more than 4600 primary schools across Australia to learn about the importance of safety and emergency services from a local crew. Members of the Fremantle rescue crew demonstrated the process of saving a person in danger and talked about their equipment including night vision goggle technology, winch capabilities, radio and navigation devices. Principal Sheryl Pilkington said it was the first time the crew had visited the school and she hoped to bring them back again. “I think it is always good for kids to see some of the equipment and things they can do at the beach,” she said. Westpac’s Morley bank manager Mandy Curtis said school visits focused on educating kids how they could avoid getting into danger and stay safe in an emergency. The crew presentation was part of the WLRHS School Program which reached 1.84 million students a year.